Ah, the office; center of productivity and progress at the workplace. The office can also be a place of stress, anxiety, being sedentary, and poor postural habits if you are at a computer and desk all day. About only 1 in 5 jobs involves physical exertion at some level, so it is important to take small breaks to stretch, energize and breathe. This one pose will benefit you in these ways and more. It can also be done without much fanfare from your colleagues watching, in case you work in an open office hub environment. The pose is a seated variation on the upper body’s portion of a Five-Pointed Star pose. I am going to call it the Office Breathing Five Pointed Star. Sit tall in your office chair. Lengthen the spine through the top of the head. If you have a particularly relaxed office chair, scoot to the edge of the chair so that you can lengthen your spine. Inhale and extend your arms out to the sides of your body at shoulder height, extending through the fingers. Take permission to bend at the elbows or hold the arms long with no bend in the elbow. The spine becomes better aligned or realigned by the simple act of sitting up taller. This simple activity will stretch and open up your shoulders, which may be aching or hunching forward as you work on a computer. Reversing the effects of forward rotation of the shoulder girdle is important to combat poor posture. Lengthening through the arms and fingers will promote circulation of the blood and oxygen through the limbs. 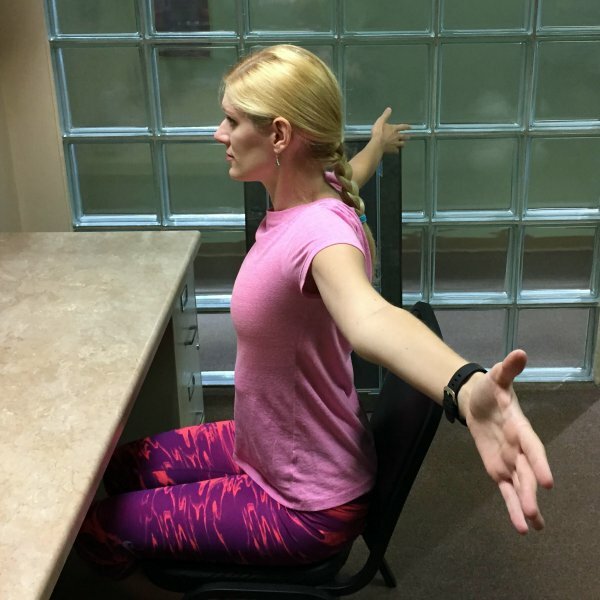 Holding and lengthening the arms will give certain nerve clusters a chance to decompress, which is important especially if you're working at a desk for an extended period of time. Adding inhales and exhales to this yoga pose variation will help relieve work stress and anxiety. Lengthen your exhales for even more anxiety-reducing breath work. Doing so will reinvigorate the respiratory system, helping the body to feel an increase in energy. Do this office version of the Five-Pointed Star at least twice during the workday. Perhaps set a quiet alarm to remind you to take the time for five to ten breaths and reap the benefits.